A policy research group that earlier this year pressed for raising the federal minimum wage above $10 an hour is saying in an updated report that doing so would boost, not harm, job creation. The Economic Policy Institute, regularly described as liberal- or left-leaning, says a Congressional bill to hike the federal minimum from the current $7.25 an hour to $10.10 deserves broad support because it would enhance the U.S. economy, which is still wounded following the 2008 financial crisis. The bill, the Fair Minimum Wage Act of 2013, proposes lifting the minimum wage in three 95-cent increments to $10.10 an hour, with variable, inflation-based increases thereafter. 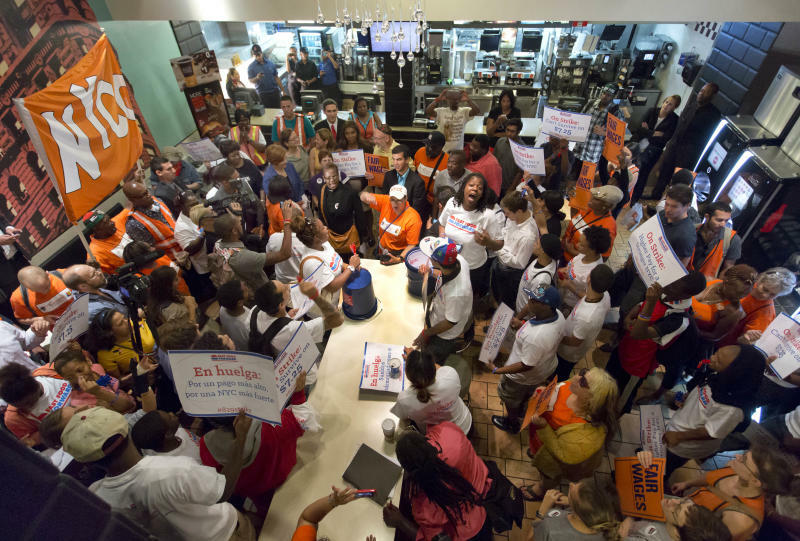 The measure, introduced by two Democrats, U.S. Rep. George Miller of California and Sen. Tom Harkin of Iowa, would also raise the base wage for tipped employees. The group says an hourly wage of $10.10, a level 39% higher than today, "would return the federal minimum wage to roughly the same inflation-adjusted value it had in the late 1960s." In 1969, the hourly minimum wage was $1.30. The current $7.25 took full effect in July 2009. A history of the changes in federal minimum wage can be seen here, and, for reference, the Bureau of Labor Statistics' inflation calculator indicates $7.25 in 2013 has the same buying power as $1.14 did in 1969. According to EPI's research, a level of $10.10 "would either directly or indirectly raise the wages of 27.8 million workers, who would receive about $35 billion in additional wages over the phase-in period." EPI says the average age of workers who would get the new rate is 35, with around 54% of them working full time. "A lot of states and even a lot of municipalities have all boosted their minimum wages out of a recognition that the federal minimum wage is just too low," EPI's David Cooper and the author of the report said in an interview with the Huffington Post. The pay increases would be worth $22 billion to the nation's gross domestic product, leading then to a net increase of 85,000 jobs, EPI contends. GDP, the value of goods and services we produce, was in the neighborhood of $16 trillion in 2012, Commerce Department data show. So that said, the pay raise, if it came to pass, would translate to about 0.14% of the overall GDP that year. And while job creation is always something to pursue, the EPI projection would amount to less than half of the nation's monthly average over the past 12 months. BLS data indicate that about 195,000 jobs have been formed each month in the past year. Nonetheless, to an individual at the $7.25 minimum, a raise of even 95 cents would make a sizable difference for them, equating to $152 over the $1,160 they would make in the course of a 160-hour month. Wages in America are a hot topic, particularly as they pertain to the fast-food and retail goods industries. Advocates for higher pay at places such as Wal-Mart (WMT), McDonald's (MCD) and Wendy's (WEN) have organized protests in recent months calling for raises. In some cases, restaurant workers are asking for as much as $15 an hour, more than twice the current federal minimum wage. President Obama has backed the $10.10 proposal. Oppenents of big pay increases have contended that businesses will be reluctant to hire if wages rise too quickly, thereby hurting their cost structures and causing them to seek cheaper solutions, such as automation in place of people.